Pep and I farm at Naringal in south west Victoria. It’s a temperate climate with high winter rainfall, an annual average of 850mm. We were using rotational grazing and feeding hay/silage in the paddock but had trouble with winter pugging. We now have a winter/summer shelter with an adjacent earthen feed pad so we can feed our cows well and protect our pasture no matter what the weather. Shelter arrived as ‘kit’. Employed local builder and labourers to construct. Had to wait on woodchips. June 2015 – it’s worked well from day 1, the cows love it! 1. Do your homework and experiment on farm to get a sense of the impact a change will make before you jump in. 2. Don’t forget to factor in on-going maintenance. In our case, the wood chips will need replenishing about every 5 years (these get recycled into compost), and the plastic roof requires replacing every 10 years. Do your homework with statutory planning –Shires can differ in requirements. Pugging is affected by rainfall as well as soil make up, so being familiar with your soil type and is also an important consideration. We value what we call ‘total balance’ – having a profitable dairy farm business that is family orientated and interacts positively with the community. We also are keen on using resources efficiently and effectively, especially pasture. Why did we want to change? We wanted to increase our stocking rate and increase productivity by 20%. I wanted to increase the business resilience to the mercy of the seasons – essentially introduce flexibility and greater adaptability to the environmental conditions we can’t control. I also wanted to better manage our pasture across the seasons, especially winter which has proven to be difficult in the past. Parts of our farm are quite low, and also rocky, so it’s difficult to achieve optimal grazing pressure and avoid pugging damage, particularly during the wet winter and spring. The previous season I’d trialled using a shed to reduce winter (pasture) stocking rates – this experiment made us realise that we needed to bite the bullet and sort the issue out properly. Importantly, it made good economic sense (Pep is an accountant!). The projected short payback gave us the confidence to spend the money and move toward milking an extra 120 cows. If we can grow 10% extra pasture because of the change, that’s an extra $30,000 a year for us! Low interest rates and factory milk pricing structure incentives encouraged us too, so with the extra production we figured we’d move up a productivity pay bracket and capitalise on a short term incentive of around $20,000 per year. 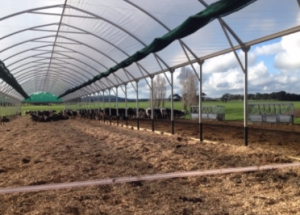 I visited New Zealand with a local vet to research the shelter structures on their dairy farms –weather conditions are straight off the Antarctic there so winds couldn’t be harsher. This gave me confidence in the durability of the shelter material. The company’s transition to clear plastic roofing facilitates UV penetration to help ensure sanitary conditions. We settled on the shelter and an adjacent earthen feedpad with hay rings and water troughs. 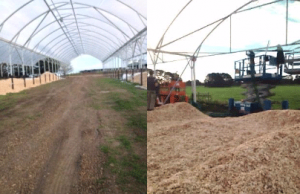 This approach was to minimise cow excreting onto the wood chips. We were pretty particular about siting which paid off as the earthworks were minimal from selecting a natural slope. The feedpad slopes toward an existing pond which has capacity to cope with the additional effluent storage we anticipated. We decided to adapt the shelter with shade cloth on the inside roofing panels, and mechanical ventilation (idea borrowed from hot houses) so that the infrastructure can also serve to mitigate heat stress in summer. The shelter provides us with versatility – in addition to seasonal protection, peace of mind, and the opportunity to intensify production without significant animal confinement, it opens up options such as fencing off areas for calf rearing and machinery or hay storage. We don’t feel as though we must use the new pad and shelter every day – if pasture conditions are ideal, the cows are out there straight away, minimising farm inputs. All in all, it was worth doing. We’re really pleased with the aesthetic look and feel, mindful of community perceptions and what our children are growing up around. The shelter has provided flexibility and the capacity to adapt to both wet and hot conditions. We’re milking an additional 60 cows, and plan to add another 60. Previously we were feeding silage and hay in paddock so bringing this into hay rings on the pad has not only reduced wastage, but also increased my options of supplement. I now have the capacity to house half the herd for up to 12 hours a day and reduce pasture stocking rates pasture by 50% over the wettest winter period. We’d originally budgeted $260K but the mechanical ventilation option brought this up to a bit over $300K: shelter $225K; woodchips $50K; the tracks/feed pad/earthworks cost $25K. Feed and water troughs were about $20,000.